R + R by Polygon is a new mid-rise condo project located in Vancouver’s River District. The exciting new phase will feature one, two and three bedroom condo residences in a prime riverside location in this up and coming neighbourhood. From tree lined streets to miles of walking and cycling trails, the River District R + R Vancouver condos is one of the most impressive developments this year. There will be a great selection of new dining, retail and shopping nearby as well. A superb urban lifestyle filled with Rest + Relaxation, the River District Vancouver R + R condos are coming to the market in Spring 2016. Riverside + Restaurants. Recreation + Rejuvenation. This is R+R Vancouver condos by Polygon. Featuring west coast architecture and signature elements such as heavy timber and steel beams, structural glass, a dramatic cantilever canopy, metal accents and brick cladding, this modern and unique mid-rise tower will be a landmark in South Vancouver’s River District. As well, there is a modern entrance that leads into an impressive lobby where natural stone and wood elements create a unique R+R Vancouver condo experience. Some of the streetfront homes will boast articulated entry ways with attractive metal and brick detailing as well. The building itself will have a well lit underground parkade with security cameras and emergency buttons for added security. There is an enterphone system with security camera outside the main lobby in addition to exclusive key fob access to parking and common areas. Every home at the River District Vancouver R+R Condos will have a heavy deadbolt lock and door viewer and ground floor homes will have pre-installed alarm systems. All homes come with the comprehensive warranty protection by Travelers Guarantee Company of Canada (2/5/10 years). Please also note that R+R Vancouver condos are built to Built Green Rating GOLD standards. For more details about the R + R Condos in Vancouver please visit Polygon’s web site at www.polyhomes.com or you can register online here on our blog page and we’ll get back to you soon. A boutique collection of Vancouver urban apartment residences is coming soon to the River District. R+R Condos by Polygon is a new community with infinite possibilities for residents. The superb lifestyle choices include: Rest + Relaxation, Riverside + Restaurants, Recreation + Rejuvenation…These R’s symbolize writing your own story – the kind with all the wonderful parts of life. 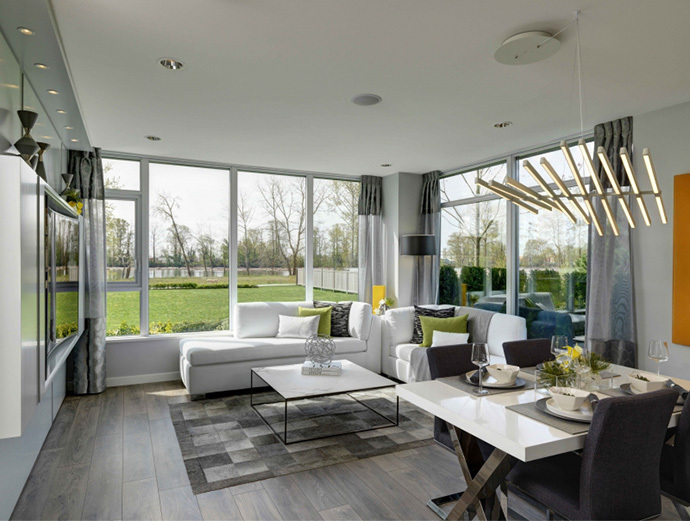 The master planned community of South Vancouver’s River District features a brand new neighbourhood with beautiful tree lined streets, walking trails and green parks. R + R River District condos is within walking distance to a great number of resort style amenities and it’s also a short drive away from central Vancouver, Downtown, YVR and Richmond. As the River District Vancouver South neighbourhood gets built out over the next decade, the list of urban services and conveniences will skyrocket and will include such things as grocers, banks, cafes, restaurants, daycares, community centres and much more. But you can get in now with the launch of these new and beautiful homes at River District R+R Vancouver condos that represent great value in this climbing market place. Your home at R + R by Polygon will be filled with thoughtful interior details such as spa style rain shower heads in the ensuite bathrooms and a sleek gourmet kitchen with great appliances.There are also generous storage and closet spaces throughout your residence to allow you to live and work with liberty. The on-site amenities include a resident manager, fully equipped fitness studio, a central courtyard and children’s play area. The location of River District Vancouver South is also impeccable. A few minutes from Burnaby’s Metrotown, a stone’s throw away from Richmond, and only from the beautiful YVR airport, the River District neighbourhood is ideally situated in South Vancouver with views of the Fraser River. Covering 130 acres, the River District will include shops, restaurants, schools, daycares, parks, a community centre and more. Designed by a world-class team of planners, architects and engineers, this master-planned community will offer a new way to live, work and play in Vancouver. Go for jog around the Riverfront Park or hike through one of the many paths and trails along Everett Crowley Park, located within walking distance from your door. Enjoy a round of golf at the Fraserview Golf Course or spend a few hours at the driving range. Homebuyers will enjoy the shopping conveniences of the nearby Marine Way Market including London Drugs, Canadian Tire, and Cactus Club Café. The newest phase at River District features some of the most impressive modern features of any new project in the community. 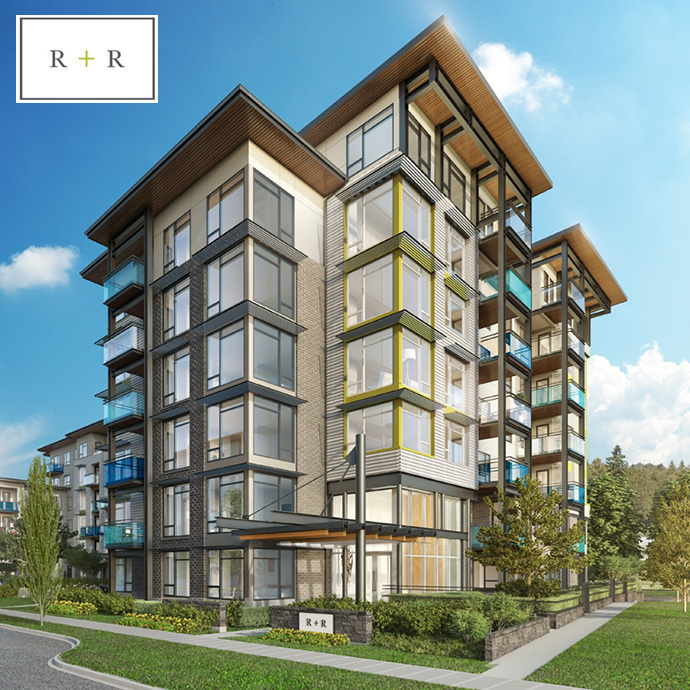 R + R Vancouver condos will feature spacious, open layouts with nine foot ceilings, rich wood style laminate floors, plush CRI Green Labl carpets and in floor radiant heating system throughout the home. Also, presale Vancouver R+R homebuyers can choose between Sky or Earth colour palettes. Windows are low-E and maximize energy efficiency and there are decks/patios for outdoor living. The beautiful kitchens feature a premium stainless steel Energy Star rated appliance package, sleek under mount double stainless steel sinks, polished chrome faucet with versatile pull out vegetable spray, roll out recycling bin station, under cabinetry light, soft closer hardware for doors and drawers and premium quartz counters and stone backsplashes. 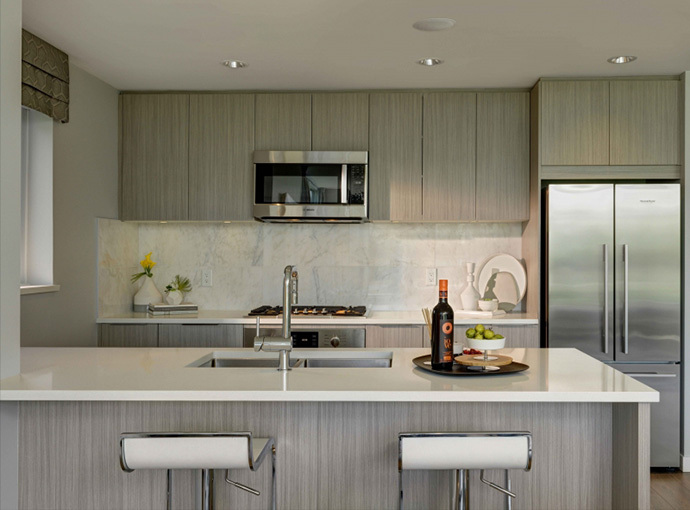 The kitchens at R + R River District also feature custom square edge cabinetry and some homes have special cabinet features like pantries and lazy susans. The spa inspired bathrooms feature elegant ensuites with full walk in showers with frameless doors or contemporary shower and tub combinations. The spa inspired ensuite shower features an oversized rain shower head, porcelain tiled surround and a built in niche and integrated bench seating in most homes. The bathrooms also feature floating vanities with soft close cabinetry with chrome hardware, under cabinetry lighting, rectangular under mount sinks with polished chrome wide set lever faucets and designer selected porcelain tiled floors and sparkling quartz stone counters. The R + R Vancouver River District condos for sale also feature dual flush water conserving water closets with soft close lids and second bathrooms have stone counters with square line profile cabinetry, tubs or glass walk in showers in some homes.